This script makes switching to another viewport when maximized behave like pre-max2010. It prevents a reset of the view so when you switch back and forth you get the view back as you left it. 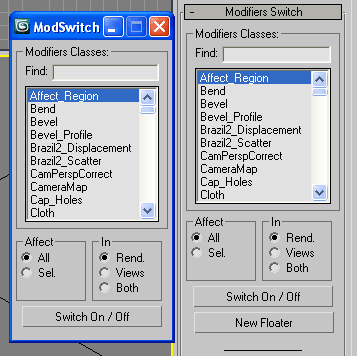 Turn On/Off in Renderer, Views or both, all or selected modifiers by class. Assign the macroscript to a hotkey. Space bar for example. A menu will appear around your cursor that allows you to quickly switch to different views. For the installation simply drag and drop the mzp file to the viewport. Go to Customize/Customize User Interface/ Keyboard. 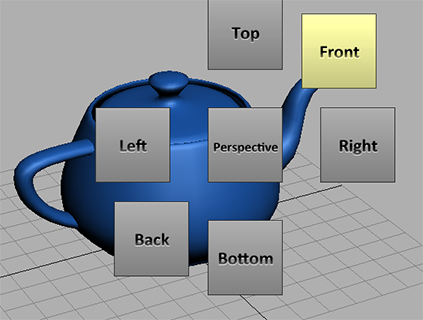 And under the group Norman3D select Viewport Swtich and assign it to a hotkey. This script will switch between the default lights, that's available through the "Create" menu, and any other light setup that's in the scene. Just drag and drop into 3ds max. The script can accessed be under the "Toke Scripts" category. Assign these scripts to buttons of NumPad. Left=Num4, Right=Num6, Front=Num5, Top=Num8, Bottom=Num2. Now is not necessary to press the Zoom Extents Selected, when switching of view. Теперь не надо нажимать Zoom Extents Selected когда переключаешь вид. The only one hotkey toggles Create mode and Modify mode. Works as cycle. Convenient to exit / enter the edit mode of the object. Только одной кнопкой переключает Create mode и Modify mode. Работает как цикл. Удобно для того чтобы выйти/зайти в режим редактирования объекта. Switches quickly between two selections (objects or sets). Useful for any type of jumping back and forth between two objects - like in alignments.